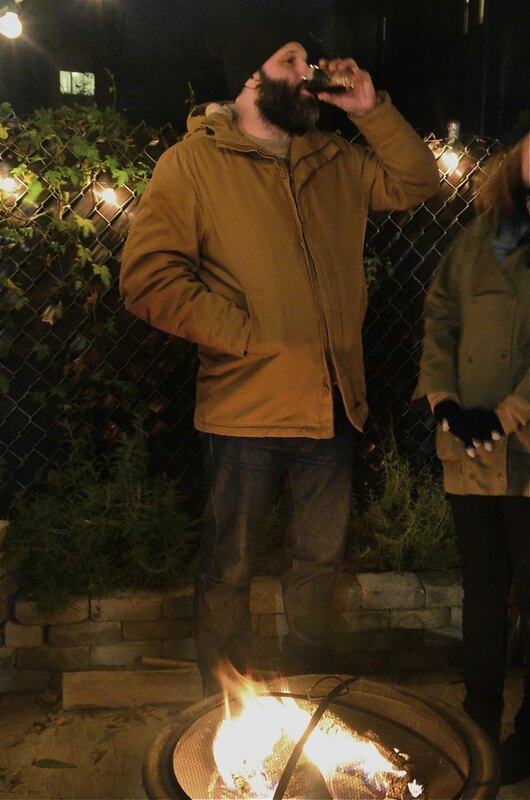 Tuesday night was blustery and frigid in Bushwick. The kind of night that makes you count your blessings, and your toes. Storefronts were gated and happily dark. The neighborhood was in for the night – taking solace indoors from 33 mph winds and teen temperatures - but soon emerged the bold and the hungry. Those few brave souls ventured out towards the warm glow of a familiar place. Fritzl’s Lunch Box has become a neighborhood go-to for those seeking love and warmth and good food. 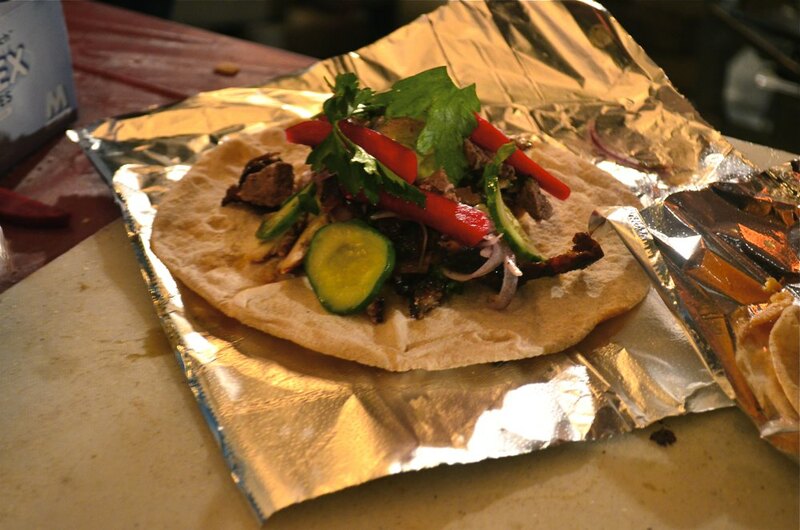 What better temporary home for a shawarma pop-up shop? 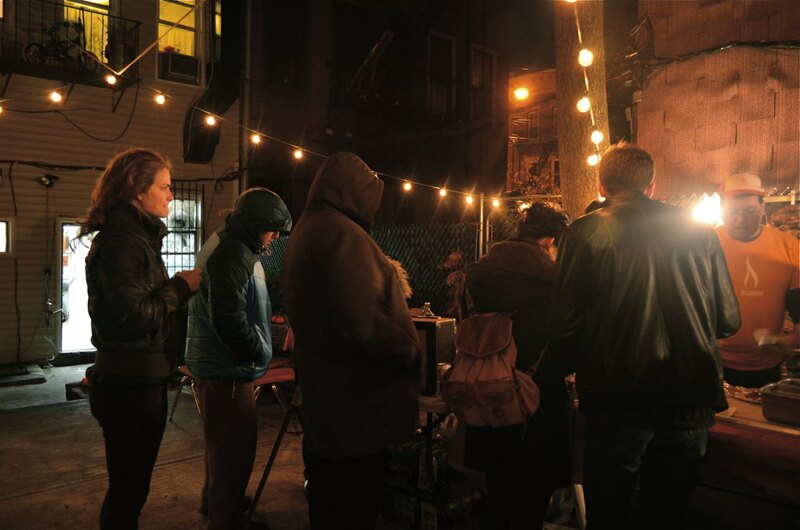 Furn Shawarma creator/chef and Momofuku vet, Scott Garfinkel, met the frosty night with hot shawarma and cold beer in the backyard of Fritzl's. Walking through Fritzl’s, you can always feel a sharp anticipation as you push aside the magic curtain, do a smell-by of the well-tended kitchen, and pass through the portal to patio paradise. Tuesday’s paradise held a new sight to behold. Stepping up to the main level of the concrete patio you were slapped silly by your own senses. String of garden lights hovered overhead, the warm-weather herb garden was now a retaining wall frame for a spitting fire pit, and the dirty genius of the Wu-Tang Clan body-slammed your memories of simpler times to the present. 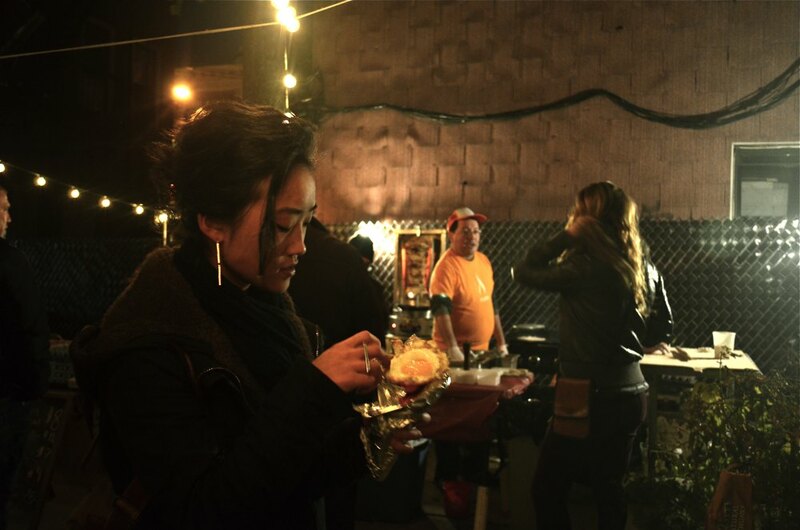 Clamp flood-lights lit a familiar Smorgasburg-type set-up for shawarma, shawarma, shawarma. 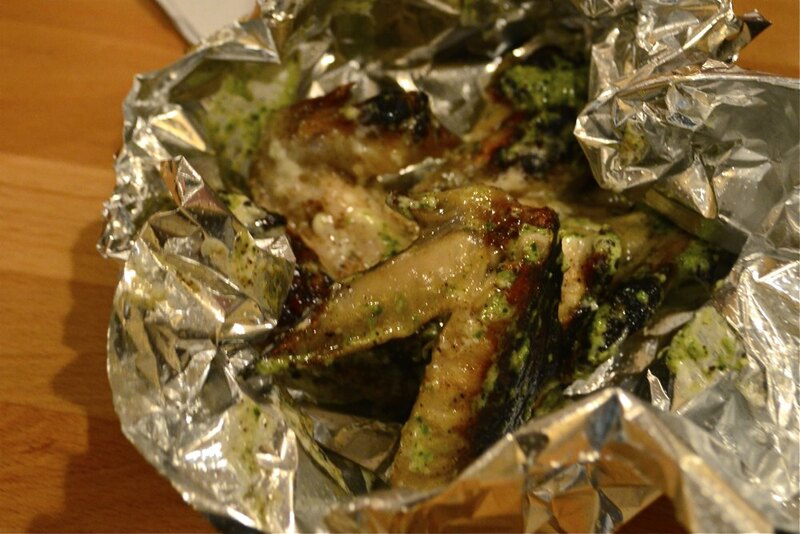 The menu consisted of Furn’s signature chicken shawarma, Garfinkel’s “Brooklyn Mix”, a vegetarian sandwich, yogurt-brined wings with garlic toum, chili and spices seared on the grill, and great northern beans with braised lamb neck and a kale and tomato sauce. All that, plus pitas made to order. 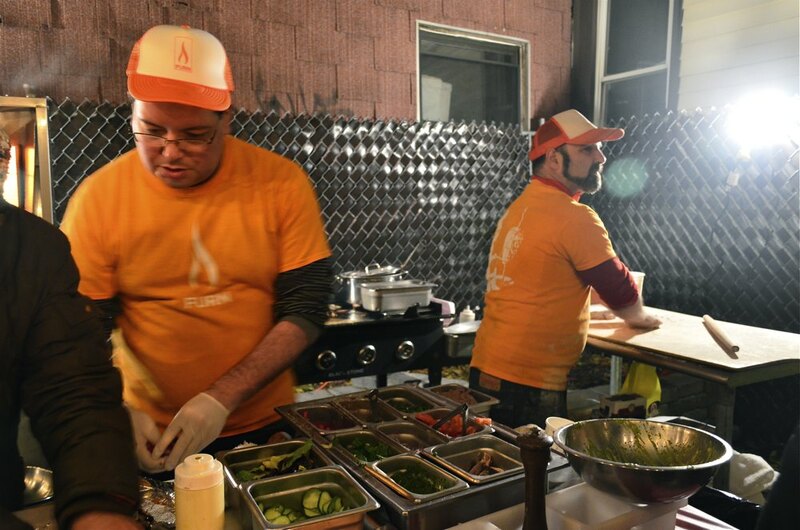 Garfinkel describes his “Brooklyn Mix” as a play on the Jerusalem mix – traditionally, fried chicken with liver and onions and chickpeas on a pita with different sauces. So what’s in our mix, BK? Chicken shawarma with the addition of chopped chicken liver and hard boiled eggs, fried onions, spices, seared smoked lamb breast, and a fried egg crown. Staying true to the ways of Furn Shawarma’s often-featured tag “Farm to Shawarma," Garfinkel’s vegetarian sandwich housed hearty mouthfuls of local farmer’s market cauliflower. Widely-grinning and bearing the fierce cold, we all stood around the fire-pit with our aluminum foil treasures. Closing our eyes to to imagine palm trees (or the warm glow of hell), silence fell and made us laugh. Intermittent sniffles and the peeling of metal foil were the only sounds that broke through the pops of the fire and the lullabies of Capone-n-Noreaga. Fritzl’s owner Dan Ross-Leutwyler and his wife Carolyn Bane (chef and co-owner of Pies-n-Thighs) stood closely by, seeming warmed by each other and the sight of a fellow creator. I held my Narragansett tallboy in my left hand; my chicken shawarma in my right. I already thought of when I could get my next shawarma fix. I thought about this campfire that I’d have the pleasure of smelling on my long johns for days to come. I thought back to the phone interview I had with Garfinkel nights before. I recalled my favorite sound byte, and I knew I wasn’t the only one happy to anticipate more events like this in Bushwick. 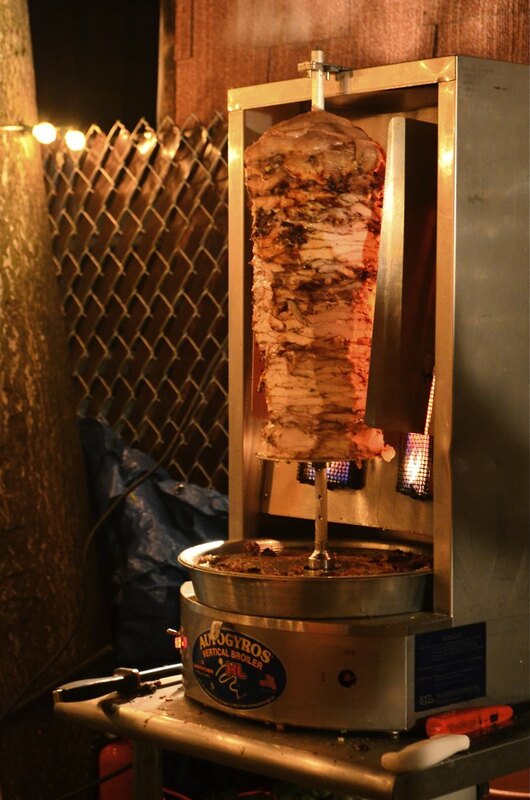 “I love Brooklyn more than any other place in the world - it’s the culture, it’s where I live, it’s where my heart is.” Scott Garfinkel, you had us at Shawarma. As proved by Tuesday’s turnout, the bold and the shawarma-hungry will venture out for our just rewards. Even in the worst weather, Scott, if you build it - we will come.